Sydney, as the cooler weather is upon us (as at the time of writing this) - many of us are in the mood for a hearty feed. Pasta definitely falls into this category...well (again) for many of us anyway. Where is the best pasta in Sydney? Crinitis does wonderful authentic italian pasta. They even have their flour imported from Italy! There are a couple of restaurants around Sydney including Caste Hill and Parramatta which offer a range of other carb loaded and delicious meals. 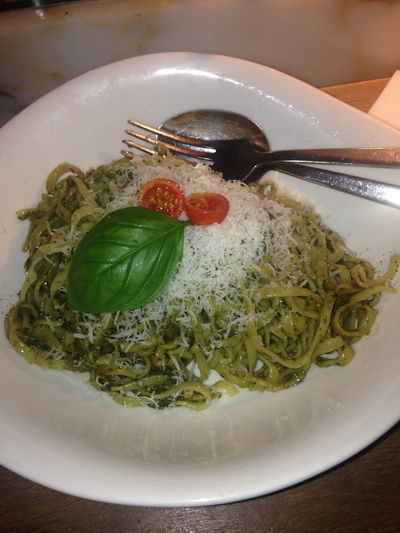 As per the picture, I thoroughly enjoyed the Pesto Basilico ($14.90) at Vapiano in the city. They make it quite quickly, and you can watch them make it. Suitable for gluten free and vegetarian diets too. Love the basil pesto with home made roasted pine nuts. You can choose what type of pasta you want too - I chose linguine. Otherwise anywhere on Norton Street Leichhardt is divine - especially in the Italian Forum. Bay St Brighton too. An interesting question that made me realise I don't think I've ever eaten pasta out in Sydney! Strange, because I am a pasta lover. But I usually buy a packet of gluten free pasta from Woolworths or Thomas Dux, and whip up my own at home. That way I can enjoy leftovers for lunch the next day.